Note: The following is a reading response that I wrote for my Mass Communications class, earlier this year. I’ve added photos, links, and formatting to make the content a little more readable online, but other than that, it is identical to the version I submitted. In “Imagined Communities: Reflections on the Origins and Spread of Nationalism,” author Anderson (1991) explores the idea of a nation being both a political and sociological construct. In the first three chapters, he starts by defining nationalism in abstract terms, then proceeds to analyze its cultural roots, and finally, he reviews the changes in society that made a national consciousness possible. While reading the text, the concept of nationalism being “imagined” interested me. “It is imagined because the members of even the smallest nation will never know most of their fellow-members, meet them, or even hear of them, yet in the minds of each lives the image of their communion” (Anderson, 1991, p. 6). I could think of various instances in video games, for example, where I took on a certain nationalistic alignment to fit the narrative of a fictional world. Some games have obvious lines set in the sand – players are either with faction A, or faction B. More interesting to me is a crime-based game, Grand Theft Auto (GTA) Online, which has no pre-established separations between players. 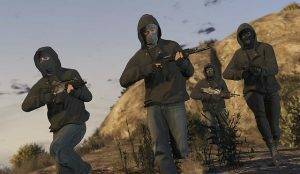 It has the concept of “crews,” akin to gangs, but generally, these facilitate the same group of players playing together, rather than instigating crew versus crew conflict. I recently joined a crew tagged “SAFE,” one which shares a unique governing ideology – no player-directed violence is to be tolerated against its members. GTA Online was not created with this type of cooperation in mind. Its structure is one where multiple 30-player limited sessions exist simultaneously, where random players can join at any given time, and player versus player combat is enabled by default. To achieve its goals, SAFE makes use of the game’s “kick” feature to remove players that refuse to follow their rules. With enough numbers, they can effectively take over a session, turning it into a kind of self-policing nation-state, reflecting the overall SAFE collective’s vision and ideology, despite lacking any pre-established or geographically-set boundaries to their influence. Membership in SAFE results in a powerful symbolic association – the mere sight of the SAFE tag evokes a certain sense of camaraderie. Yet, while I may not meet all members of SAFE, I know that elsewhere, other members are reinforcing the nonviolent, cooperative nature of the whole – an imagined sense of nationalism ensues. Anderson (1991) lists three fundamental concepts that had to fade from society to make it possible to “imagine” a nation – I will mention the two most relatable to GTA Online. First, “the belief that society was naturally organized around and under high centres – monarchs … who rules [sic] by some form of cosmological (divine) dispensation” (Anderson, 1991, p. 36). 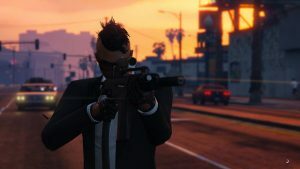 Indeed, in GTA Online, which mimics a contemporary American cityscape, there is no clear, overarching monarch figure to which players can pledge servitude. Second is a “conception of temporality in which cosmology and history were indistinguishable, the origins of the world and of men essentially identical” (Anderson, 1991, p. 36). Within GTA Online, the world and its history are, by necessity, taken at face value. Anderson, B. O. R. (1991). Imagined communities: Reflections on the origin and spread of nationalism. London: Verso.